This article will discuss updating multiple records at once from the Knack Builder. 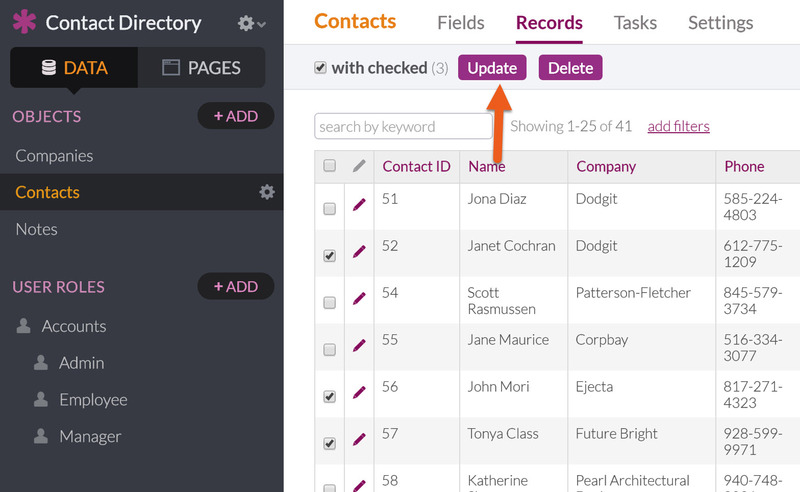 You can also perform batch updates via import by matching your records to a unique field. See the Import Records article for details on matching to update existing records. While you can update your records in the builder by clicking Data, selecting an object, and clicking the records link, as seen below. This is convenient for updating records one at a time, but isn't very useful if you need to update multiple (perhaps hundreds) of records. Knack gives you two ways to update batches of records, with checkboxes to select individual record and with "Update" button with the batch update feature. The second option is to use the Update button that appears at the top of the page, this will allow you to filter which record you wish to update. You can add multiple fields/values to update by clicking the green + icon. Click Update Records to run these updates. Each record will get updated with the new values. Once the batch has run, you'll see a message appear in the Job Notifications tray.